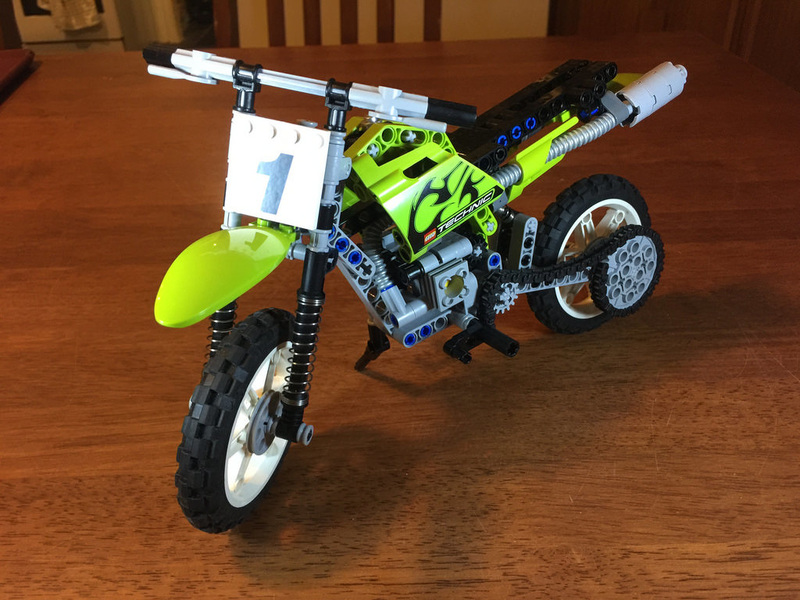 When I was a kid, I got 8838: Shock-Cycle for my birthday, and thought it was the coolest set I owned. It wasn’t available in Australia, so my folks brought it back from Europe. I was stoked! The big wheels, shock absorbers and a proper chain! It was the best, and I still remember steering it all through the house trying to jump it off everything I could. 25 years later, and I’ve built the upgrade, with that feeling coming back in spades. This set was oh so close to being one of the rare ones in the bulk lot that was totally complete, but alas, I was missing a handful of chain links. Getting to the last element to add on to find it incomplete was rather frustrating! 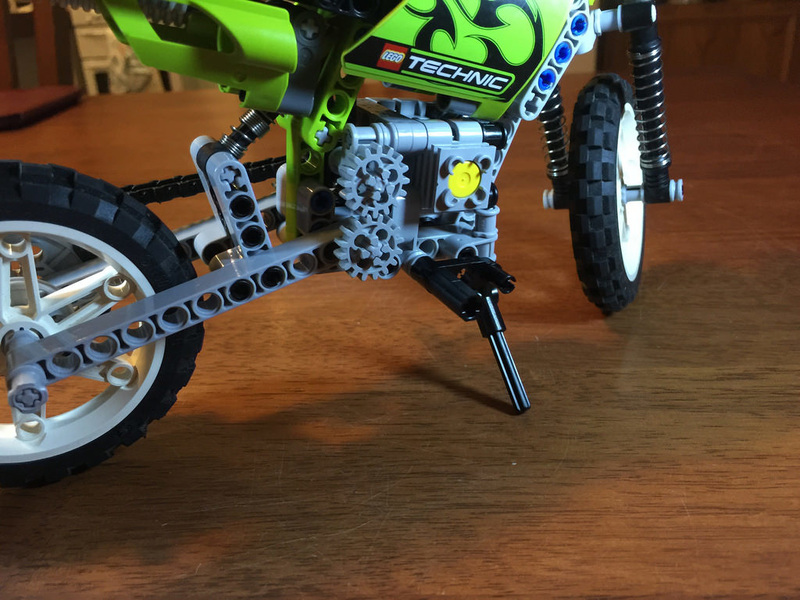 For a smaller Technic set, I thought these elements were pretty decent. Nice lime green panels in various shapes, those two big wheels and tyres, the shock absorbers, and the chain are the key elements and are still quite hard to source in other sets. 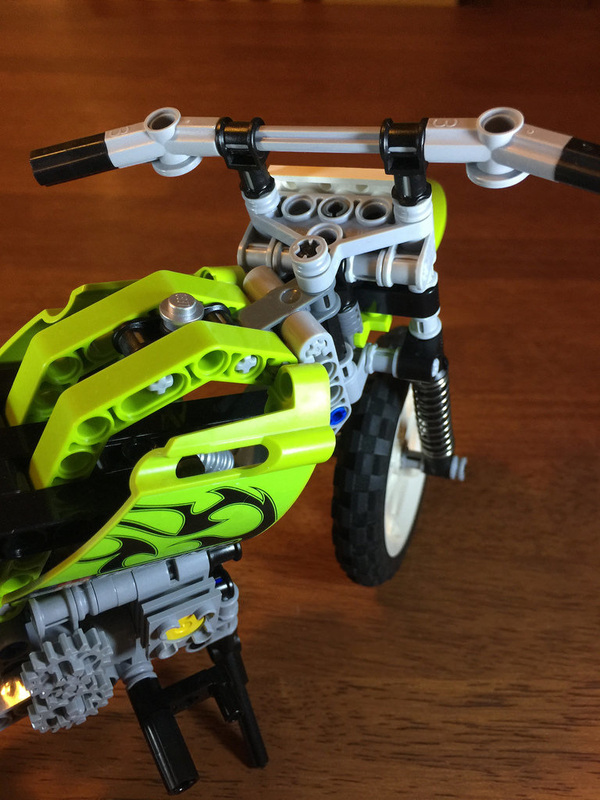 The remainder is a pretty standard display for a Technic set, but still good to have. While the model ends up being quite large, at just over 28cm, it’s only really good for one thing – scooting around the house. It’s of course a one-trick pony, but it still is quite fun, especially with the suspension action. 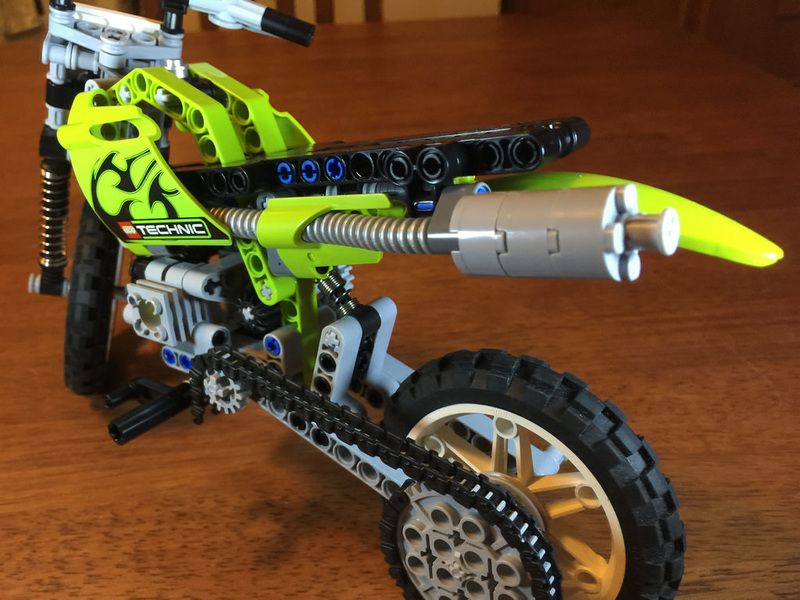 I love Technic builds. They’re heaps of fun, and it’s always intriguing to see how a set is put together. This one was no different. It was a reasonably straight forward build, with the separate sections coming together pretty smoothly. Not much to say really, except that it was enjoyable. The look of this bike is close spot on with the real thing, and I love the little signs they’ve used on the handlebars as brake levers. It’s really clever. The colour scheme is simple, but effective, and the fact that it stands up by itself is also pretty great. The only gripe I have about it is the rear cog on the back wheel. It’s too big in my opinion, and looks a little odd. This set is available on second hand markets for a higher price than I would have anticipated. At just over $40 used, and $110 new, it’s some pretty steep prices. 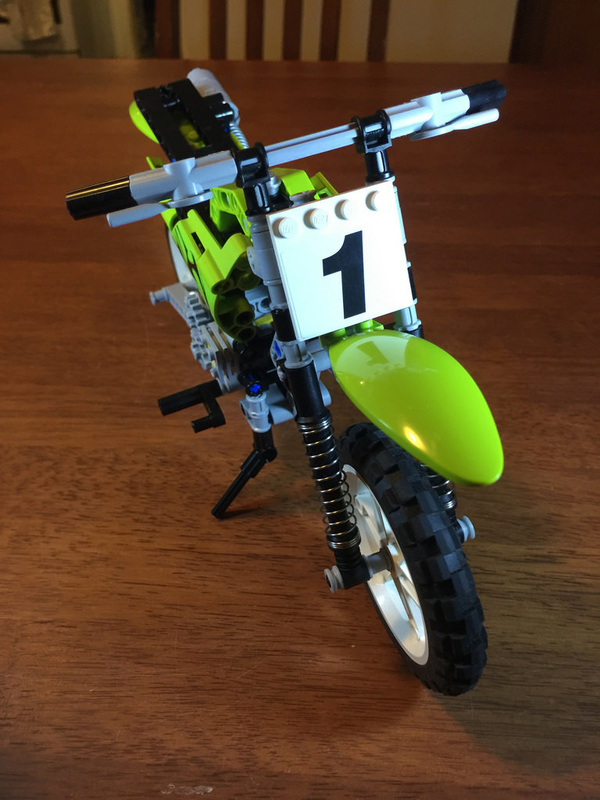 I wouldn’t call it very collectible, but there aren’t too many bikes that Technic has made of this variety, so it’s close. If you’re not precious about the MISB factor, then save yourself a bit of money and go for a used one. This is a set that’d be nice to own, and for me it’s special because of my childhood, but it’s still a set that could easily be overlooked if you had other distractions. We all know there’s plenty of them on the LEGO shelves! Not bad overall. Next week I’ll be looking at 4993: Cool Convertible. Until then, don’t forget the competition I’m running. It’s your chance to win a copy of DK’s Great LEGO Sets: A Visual History. It’s a great publication, and would be perfect for a gift, even if you have a copy yourself already.